Born on this day 98 years ago in 1920, David Warren Brubeck has the rare honor of truly having revolutionized jazz while at the same time writing part of jazz’s songbook. Although Brubeck died a day shy of his birthday in 2012, his legacy will live forever. The ways he revolutionized and altered jazz -and to a larger extent, Western music in general- are many, but perhaps his most famous contribution is his championing of unorthodox time signatures in music. The best-known example of this is Brubeck’s mega seller album ‘Time Out’, recorded in 1959. For his birthday this year, Raggy Waltz again decided that a post about ‘Time Out‘ just wouldn’t suffice. The man is so much more than that. That and the hipster in me just won’t let me do that. ‘Time Out‘ was an artistically great album, but not necessarily their best album. So, in the spirit of Christmas, the Raggy Waltz staff decided to honor Mr. Brubeck with a “12 Days of Christmas” type of series where I feature Brubeck Quartet albums that I think are just as great if not better than ‘Time Out‘. Because if there’s one thing that Raggy Waltz likes more than anything is a blog series. Disclaimer: These albums are not in any particular order of greatness. Also, this is a highly personal list. Brubeck fans may disagree with my choices. Now with that out of the way, here’s an album that’s kinda like ‘Time Out‘, and it satisfies my inner hipster. Music, to the! 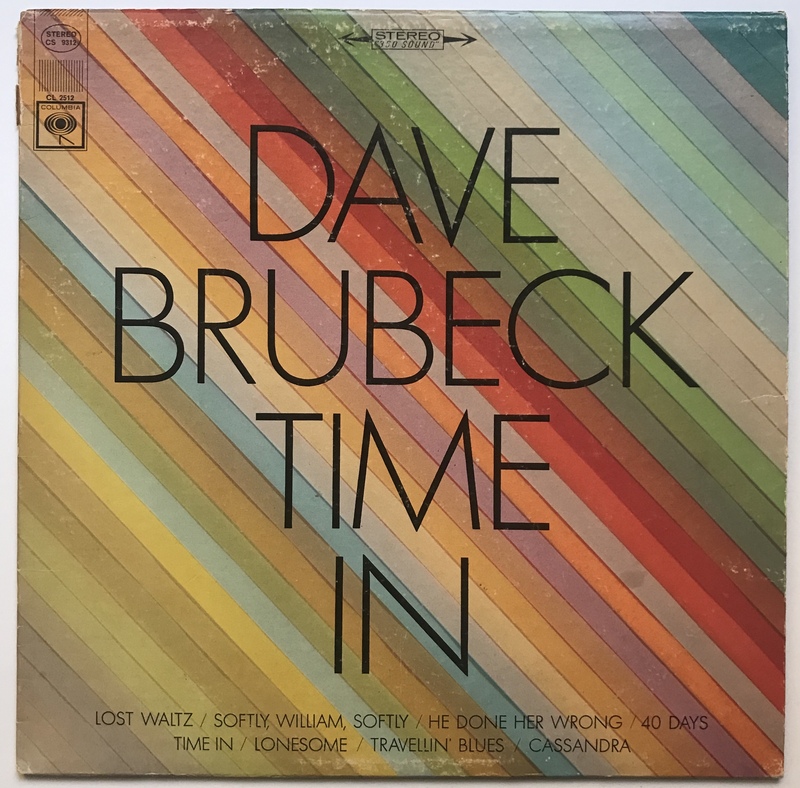 Recorded six years after ‘Time Out‘, Brubeck’s final time-themed album has been called his most musically adventurous. I agree. While there’s nothing crazier than 2 against 3, which was child’s play to Brubeck’s group by 1965, the music itself is compositionally mature and interesting with catchy hooks and harmonies. All of the tunes on the album are Brubeck originals, some written in tandem with Brubeck’s wife Iola. Many of tunes were rather uncharacteristic for Brubeck’s group and are drawn from a variety of sources, making for an eclectic album that proved that the Brubeck Quartet still had plenty of mileage in it. The group gets down to business on the very first track, “Lost Waltz”, so named because although Brubeck begins the tune as a slow waltz, when the rest of the group comes in, the slow waltz is given up for hard-driving 4/4 straight ahead jazz. It’s a great opener, and they never do find that waltz again. It’s tempered with the second song, “Softly William, Softly”, a wistful ballad written by Brubeck for a special musical adaption of a book. Desmond is at his plaintive best, staying in the upper register of his alto sax to create a mournful mood that Brubeck takes up and develops before taking the tune out. This being a Brubeck album, there are in fact some tunes that don’t stay in four the whole time. Or part of the time. The title tune “Time In” is another waltz, sans Desmond. The closing tune is “Forty Days”, an example of Brubeck’s religious compositions. The song was written as a musical depiction of Jesus in the wilderness during His time of temptation, and was part of a larger oratorio work of Brubeck’s. Written in a driving 5/4 time, familiar to all by now, its inclusion on the album is natural. By 1965, 5/4 was as natural for Brubeck and his group as breathing, and they flourish in this setting. The second side opens with an easy-going blues, this time from Brubeck’s “Real Ambassadors” project and originally sung by Carmen McRae on another Brubeck album. “He Done Her Wrong” is probably the most gimicky thing Brubeck ever recorded, and Desmond plays a perfunctory solo to match. It’s a fun little tune all the same and just another example of how adventurous Brubeck got on this album. The next tune, “Lonesome”, is another ballad but with an interesting melody line and song structure. Brubeck gets a great solo in with some muscular piano. It’s the last song, however, that gets all the honors, accolades, and awards. It may be the most un-Brubeckian tune on the album, yet it’s fully Brubeckian at the same time. How sway? The song sounds more like something a hard-bop group like Art Blakey or Horace Silver would play, not a tune that would come from the pen of Dave Brubeck. At the same time, the tune features the most rhythmically complex time signatures on the entire album. When the song starts, it sounds like Brubeck is in 3/4 but then the group jumps into a fleet 4/4 as they play the catchy theme. At the bridge, the group goes into what feels like a leisurely waltz again, but it’s still a quick 4 as evidenced by Morello’s brushing on the drums. Brubeck described it as “2 or 4 against 3-almost”, a cheeky description about what’s going on. It’s an interesting tune, and one wishes the guys spent more than a single chorus each soloing over it. Brubeck’s solo is streamlined and light (and brief). Morello gets some eights in before Brubeck takes the tune out with the catchy melody and coda. Brubeck rarely revisited the material on this album outside the studio, with “Forty Days” becoming the sole ‘standard’ in Brubeck’s book during the rest of the quartet’s career. 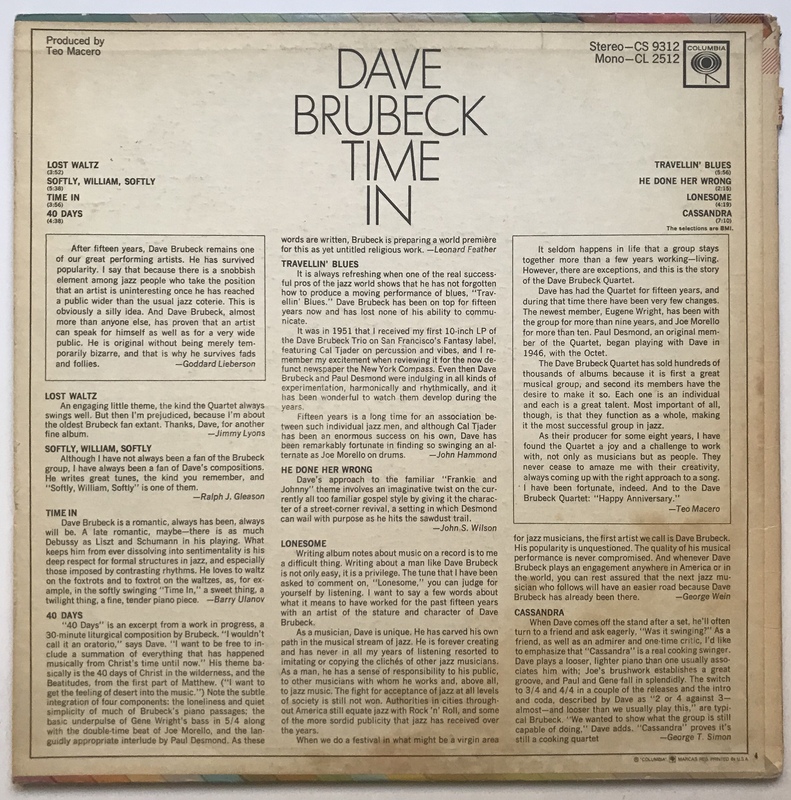 Released in 1966, Time In was Brubeck’s final ‘Time’-themed album, but was a fitting final album in that series. It displayed how far the group had come and how much Brubeck’s composing had developed. “Cassandra” alone makes this album better than Time Out. There isn’t much to say about the cover art. It’s merely adequate. It isn’t bad, it isn’t stellar. They usually threw modern art on the covers of Brubeck’s ‘Time’-themed albums. I’m no art connoisseur but I’m pretty sure that this is not a modern art painting. Correct me if I’m wrong. It’s an aesthetically-pleasing cover just the same, with pleasant colors, font choice, and title placement. Merely adequate. This album was released as a sort of 15th anniversary tribute album by Columbia, celebrating the Dave Brubeck Quartet’s 1951-1966 run. In celebration of the event, Columbia tried to get different jazz critics/writers/luminaries to say something about each tune on the album. Emphasis on “tried”. Most did. Some didn’t even bother. For instance, George Wein, of Newport Jazz Festival fame, stated outright that “[t]he tune I have been asked to comment on, “Lonesome”, you can judge for yourself by listening.” Other people tapped to contribute to the liner notes include Jimmy Lyons (“about the oldest Brubeck fan extant”), Ralph Gleason (with the slightly back-handed compliment), Leonard Feather (who wrote the absolutely scathing review of ‘Time Out’ in ‘Down Beat’) and Goddard Lieberson (president of Columbia Records and person responsible for putting ‘Time Out’ out despite resistance from within his own ranks). I’m sure all the lovely things people said had Brubeck and his group blushing. Columbia’s studio albums always sounded great. Always. Sure, sometimes the bass was boosted tremendously at times, or the stereo separation was rather extreme, but hey! It still sounded pretty audiophile-like. Columbia rarely recognized their sound engineers on their albums the way other record companies did. I assume Columbia’s legendary Fred Plaut was the engineer in the control room, but then again, I’m not so sure. There are numerous edits throughout the album (Teo Macero was famous-or infamous- for his liberal and sometimes painfully obvious edits), and some of these edits sound like a completely different studio was used. For instance, on the opening track, “Lost Waltz”, Brubeck’s intro and subsequent melody statement sounds warm and cozy. Just before Desmond comes in for his solo, there’s an audible difference in the piano. When the rest of the group comes in, the music sounds airy and more spacious. Just as Desmond ends his solo, it changes back to the warmer sound for Brubeck’s re-entry and closing statements. Could it be that the spacious sounding recordings were made at Columbia’s 30th Street Studio while the warm-sounding recordings were taped elsewhere, like Los Angeles? If that’s not enough intrigue, here’s another one, albeit a less pressing one. The label sports Columbia’s classic two-eye logo, used from the early 60’s through to the 70’s. That’s the consistent (ish) part of the label. The red color of the label seems to differ from pressing to pressing. Sometimes it was a deep blood red, other times a rosier red, and still other times a salmon pink like this label. Based on my own collection of Columbia albums, the red variants seemed to have been consistent in their inconsistency since the 1960’s two-eye label was born. At least they were consistent? The vinyl itself has a healthy amount of Rice Krispie factor to it, with some delicious snap and crackle at the beginning of the record. Lucky for me, my grandpa has been a jazz fan for decades. Also lucky for me, he held on to some of his jazz records. Even luckier, he liked Dave Brubeck and had a few Brubeck albums just collecting dust. Naturally, I was glad to take his records off his hands, including all the Brubeck albums, this album being one of them. This record and the others I received from my grandpa are among my more meaningful records in my library. Why? It’s a neat thing to pick up an album and know that my grandpa bought it 50-plus years ago. And best of all, it was free! This was a good read. Especially for someone who is new to jazz. I feel like I should get into more.